Sealing strip made of soft and elastic plastic applied to the core box separation between both mold halves. This sealing strip slightly protrudes the separation level to form a tight outward seal for the core engraving when squeezing both mold halves together. An inwards curved bead is formed the size of which can be predetermined. A groove is generated at the core which is also referred to as “negative parting” (s. Mold parting) (figure 1). 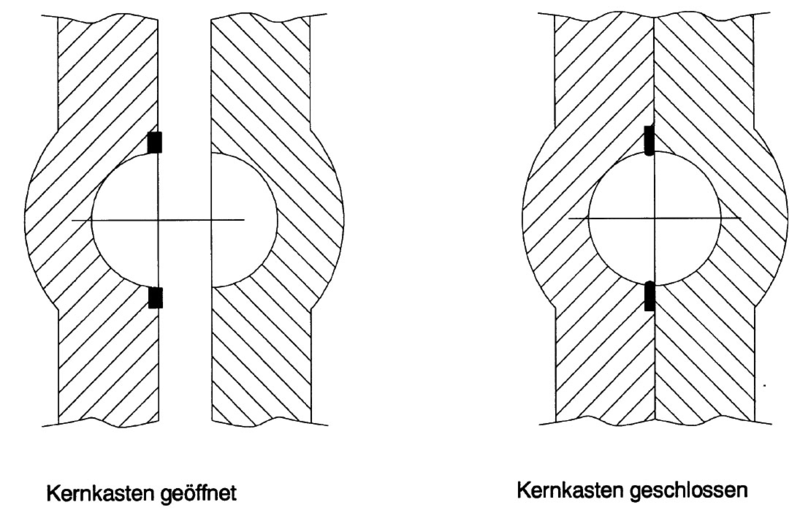 The sealing strip forms a homogenous connection with the harder basic material of the mold halves thus avoiding stripping, deformations or buckle formation in permanent operation.